Three aspiring asparagus and two fallen by the wayside… Thanks to Cynth who gifted the sweet little ceramic mug to me after our day at the Huntington Galleries. The mug with some asparagus spikes unites the still life. CLICK HERE for pricing and purchase info. 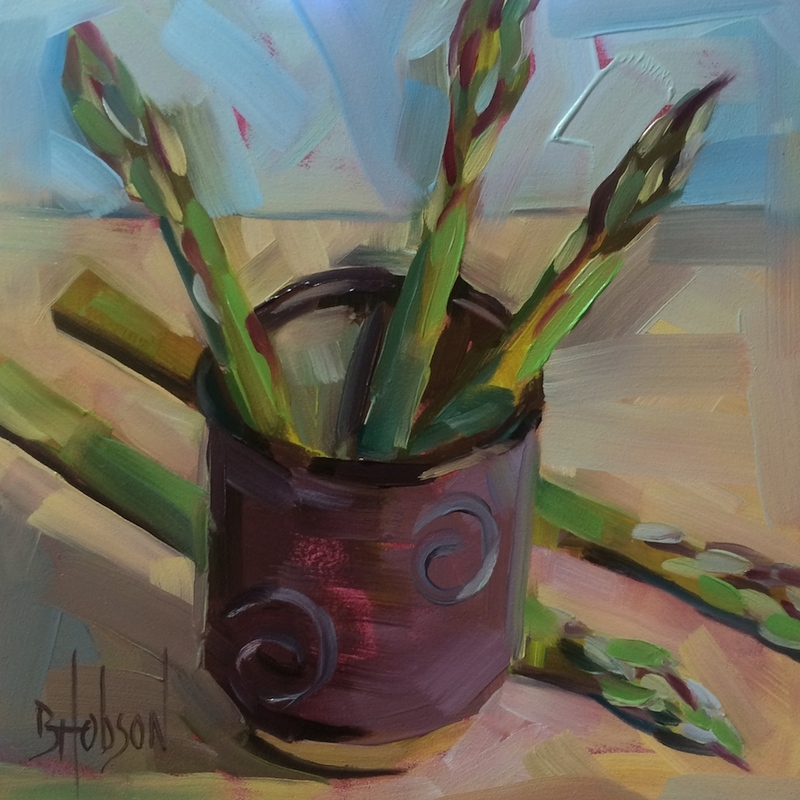 This entry was posted in Asparagus, still life and tagged alla prima, Asparagus, Bridget Hobson, Kitchen Art, Malibu Artist, oil on gessoboard, original oil painting, wordpress artist on April 21, 2015 by Bridget Hobson, artist. 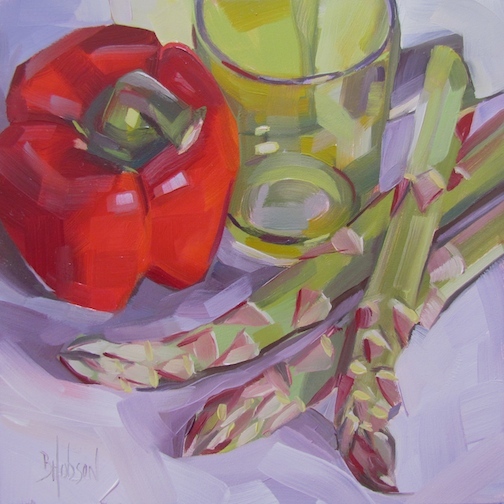 This entry was posted in Asparagus, Peppers and tagged alla prima, Asparagus, Bridget Hobson, green glass, Hobson Fine Art, Kitchen Art, kitchen still life, Malibu Artist, oil on gessoboard, oil painting, original oil painting, red bell pepper, red pepper, wordpress artist on March 24, 2014 by Bridget Hobson, artist. This was Saturday’s painting – I’m especially pleased with the color – and yes, it looks even better in real life. Now I’m off to Colorado and taking my watercolors with me, which I have not used in forever and a day. We’ll see what comes out of my brush! I’ll post this painting on Etsy at some point soon. 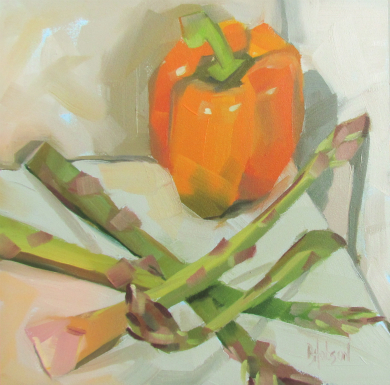 This entry was posted in Asparagus, Peppers, still life and tagged Asparagus, Bridget Hobson, daily painter, Kitchen Art, Malibu Artist, oil on gessoboard, oil painting, Orange Pepper, original oil painting, Pepper, still life on March 5, 2012 by Bridget Hobson, artist.